While the iPhone 7 and iPhone 7 Plus launched last week, the usual trend of demand outstripping supply has resulted in limited availability of the smartphones around the world. Fortunately, prospective buyers can easily check stock at their local Apple Stores using the website iStockNow. iStockNow uses Google Maps to visualize the real-time status of iPhone 7 and iPhone 7 Plus availability at Apple Stores in the U.S., Australia, Belgium, Canada, France, Germany, Hong Kong, Italy, Japan, the Netherlands, Spain, Sweden, Switzerland, and the U.K., likely based on Apple's reservation system backend. The website allows users to filter their search by iPhone 7 or iPhone 7 Plus, storage capacity, color, location, and U.S. carrier. There is also a "no CDMA" filter that narrows the search to iPhone models built for GSM networks, but note that CDMA models support both CDMA and GSM networks. 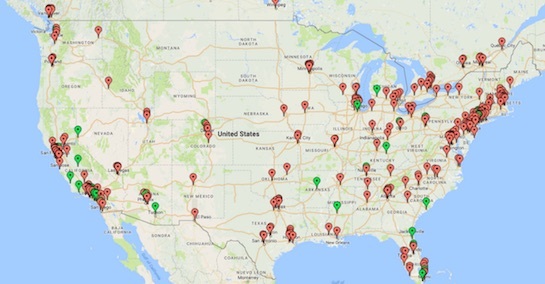 Apple Store locations with availability based on the search criteria display a green marker, while stores that are out of stock display a red marker. Clicking on an individual marker opens a window with an expanded model-by-model breakdown of availability, and the time that stock was last updated at that location. iPhone 7 Plus availability appears to be slowly improving in parts of the U.S., particularly in the New York and Los Angeles areas. 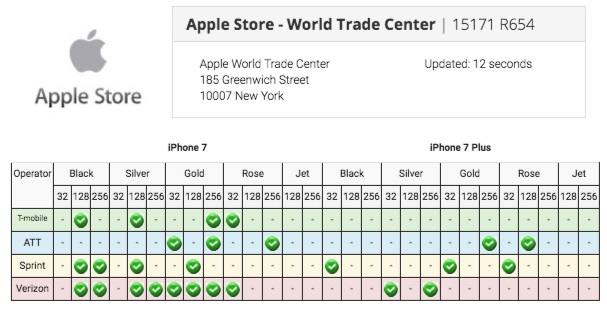 In Manhattan, for example, select iPhone 7 Plus models are currently available at Apple's Fifth Avenue, Grand Central, Upper East Side, Upper West Side, and World Trade Center locations. Shoppers can still use Apple's front-end reservation system, but iStockNow provides a more convenient way to view in-store stock at a glance. If you're on the fence about Jet Black... get Jet Black. It's awesome. Wow thanks a lot for this, kudos to all macrumors users, you made this. Site had a slow down due to the huge load, should be better now. I'd honestly wait another month before buying iPhone 7, just incase there are more issues. Where are the prophets of the apocalypse now? Website gives a 502 Bad Gateway error. dont think a month is going to make a difference, to be honest. QC issues are always a thing, no matter how far or early you are into a life cycle. Got the jet black 7 plus 128 gig on the way! In other words: incremental update reminiscent of the typical S release.